Painted on 200Lbs Bockingford half imperial. I love the effect you have given on this, it looks like the boat is old and stranded and is just sitting in the mist, with the muddy water surrounding it. I do like this painting, it has been very well executed with a range of delicate tones setting the scene. 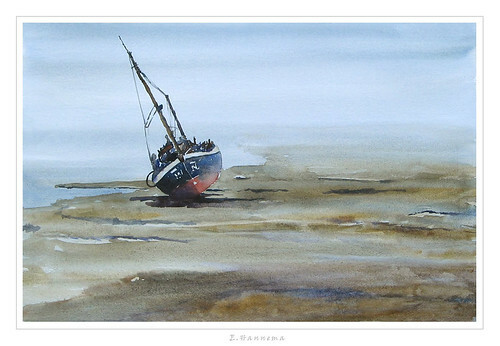 Seeing the boat keeling over on it side leads the viewer further than the painting itself and into the story of why was the boat there, where are the owners of the boat etc. A interesting subject,well done! !